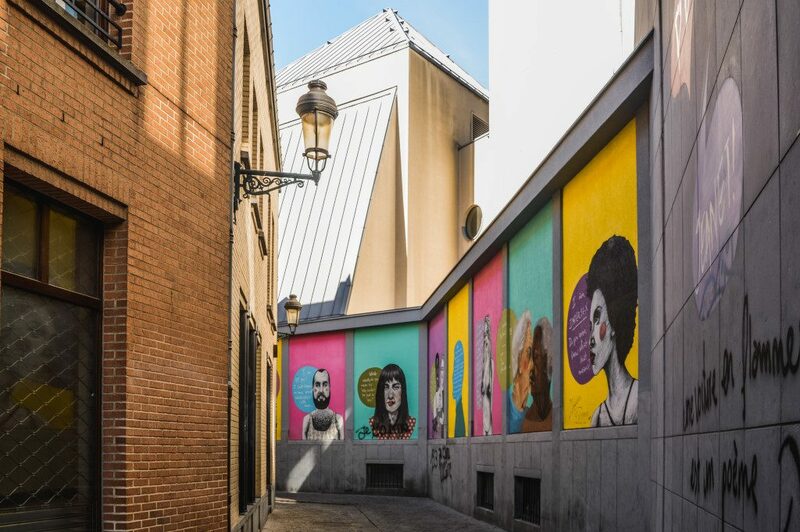 The fact that Brussels is a virtual treasure chest for art lovers is common knowledge, but did you know the Belgian capital is basically an open-air street art gallery? 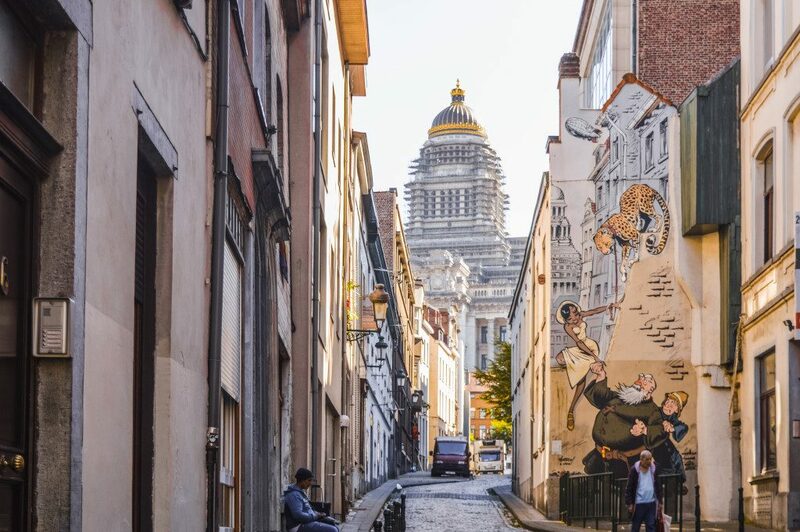 Yep, no matter where you turn, the historic centre is decorated with subtle, as well as enormous wall paintings with a mischievous sprinkle of Belgian humour. 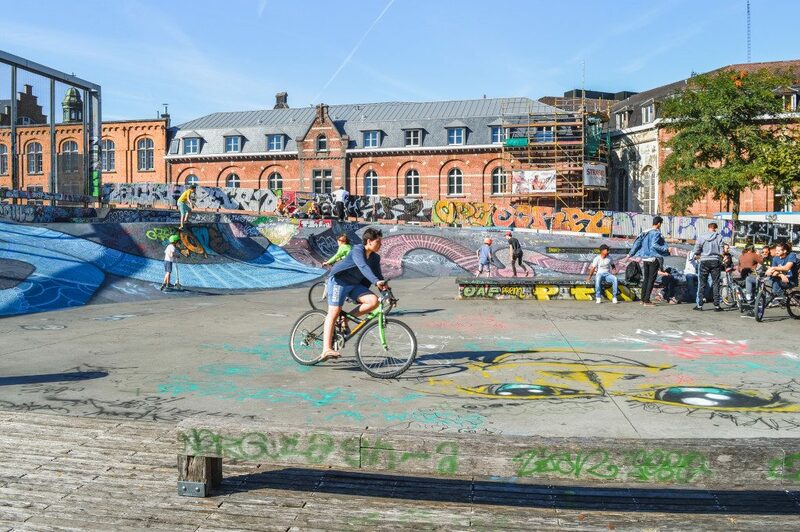 With over a million inhabitants, Brussels is one of the bigger cities in Europe, so it might seem a bit overwhelming to locate all of these urban masterpieces by yourself. 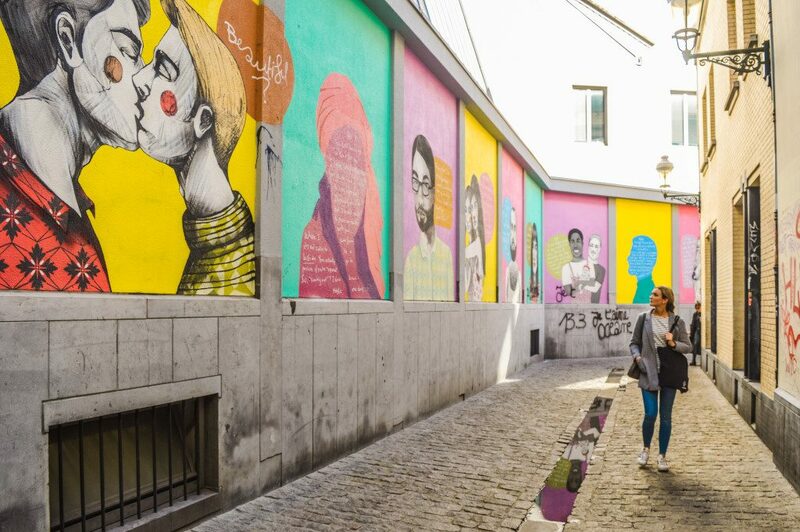 Well, don’t worry, because I’ll tell you exactly where to find the very best street art in Brussels. 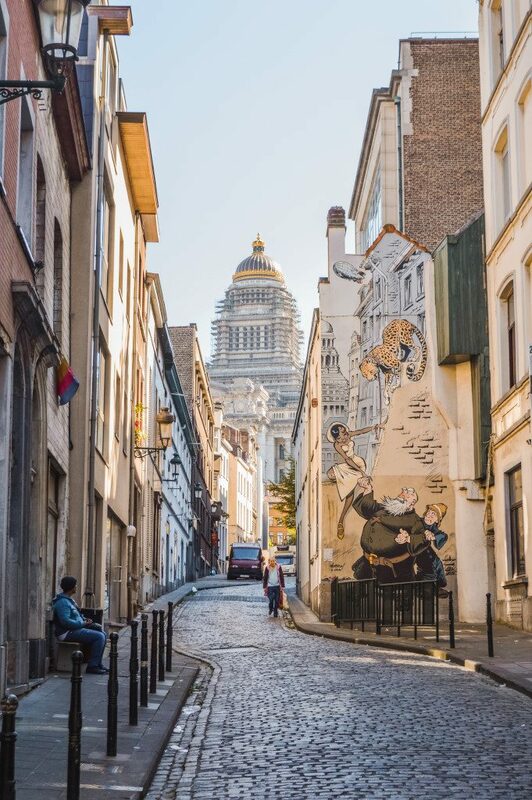 I’ve seen some amazing works in European cities, but believe me when I tell you that the street art in Brussel is in a different league. 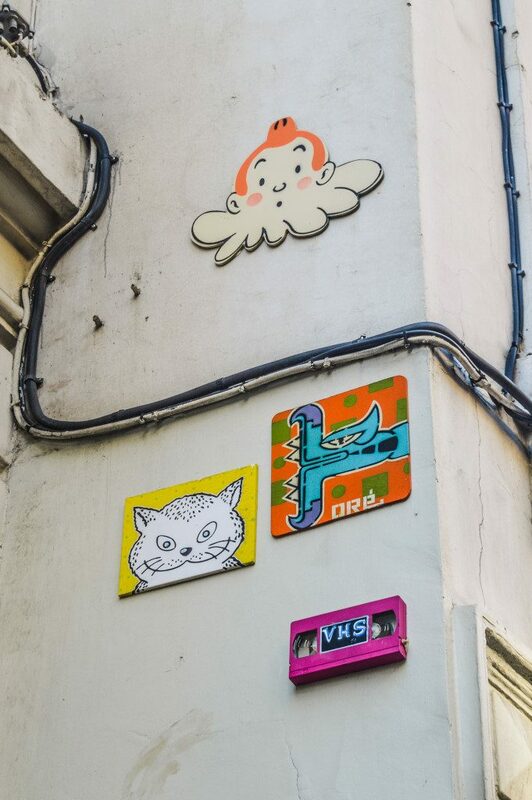 Luckily, you will find the most vibrant and unapologetic pieces all around the busiest parts of the city. Most of them are within walking distance of each other. 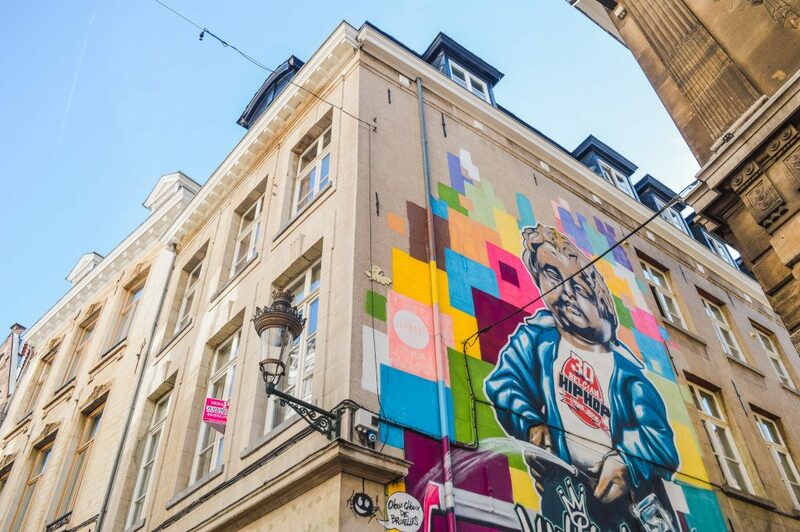 A particularly colourful and well-known mural can be found in the Eikstraat (Rue du Chêne). The piece is playfully referred to as ‘Manneken Peace’ for obvious reasons. It’s only a stone’s throw away from the actual Manneken Pis, the infamous peeing statue. In the same street, you’ll find the Arlequin music store. 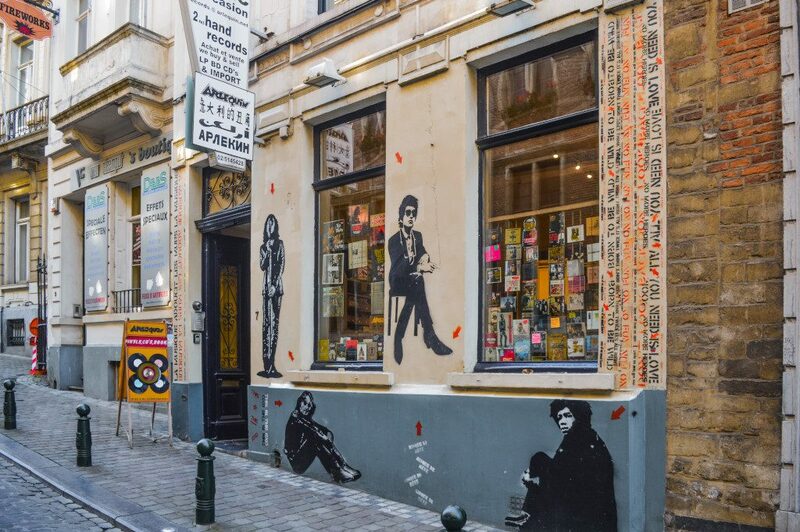 Here, you’ll see a piece by Jef Aérosol that depicts Jim Morrison, John Lennon, Bob Dylan and Jimi Hendrix. 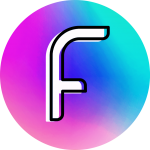 In the same central area, you can find an incredible series of LGBTIQ frescoes, as well as several other pieces. 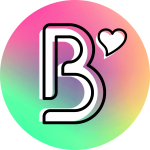 You’ll find them in Brussel’s gay quarter (or Rainbow Quarter), so head to the Lollepotstraat (Rue de la Chaufferette) to see them. It takes 4-5 minutes to walk from Manneken Peace to the Rainbow Quarter. 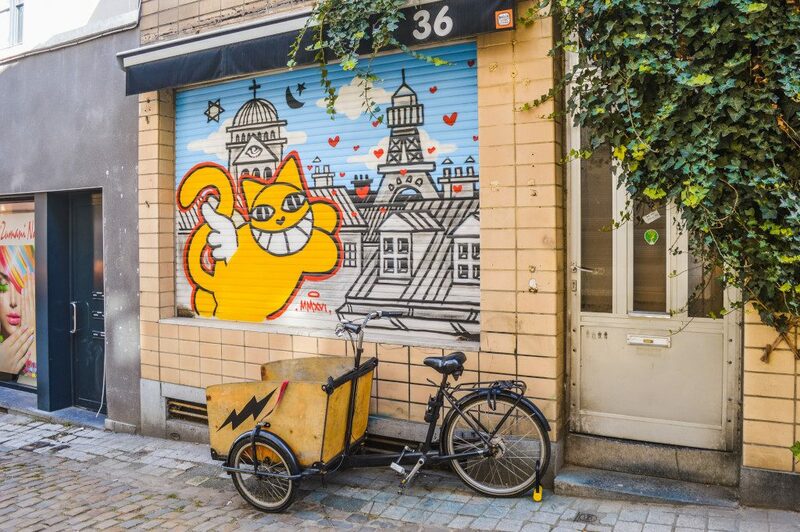 One of the best budget-friendly things to do in Brussels is to explore the neighborhoods while following the comic strip trail, also known as the comic book route. It’s a treat to walk around and encounter scenes from the likes of Tintin (Kuifje) and Spike and Suzy (Suske en Wiske) all over the city. 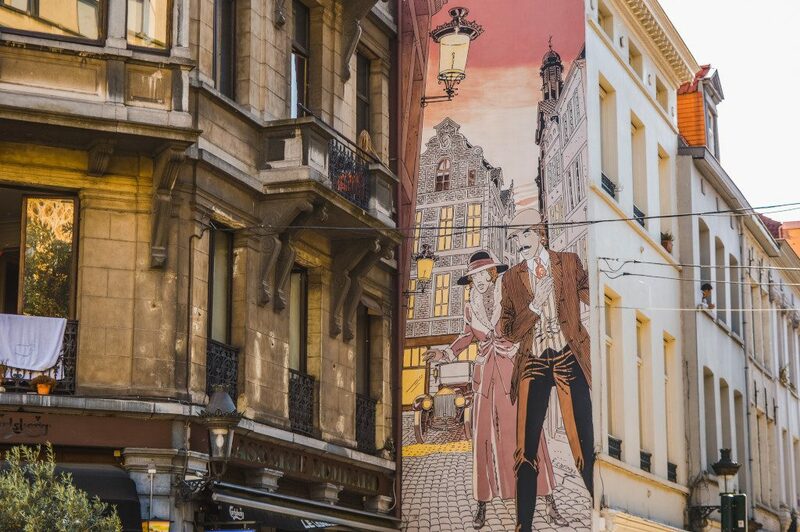 And don’t worry; you don’t need to be a comic book fan to appreciate these fantastic murals. 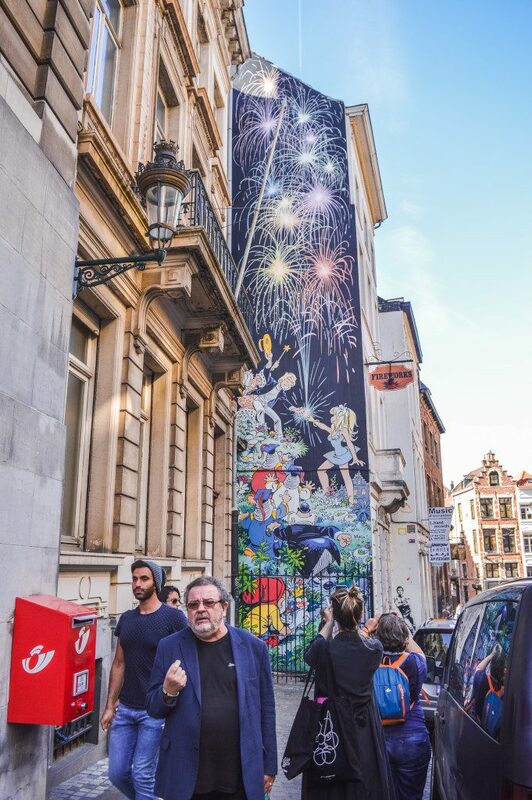 The comic book walls are pretty much everywhere in central Brussels. 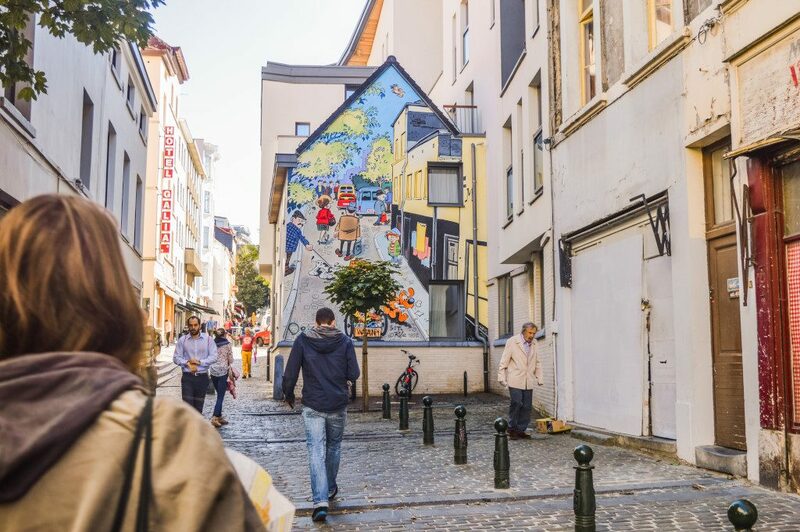 That includes the Sablon, Marolles, and Saint-Gilles neighbourhoods. 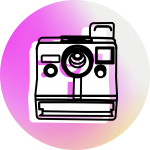 These areas are full of trendy shops, quirky boutiques, and lovely cafés, so I recommend starting your trail over there. Click here to see a complete overview of all the comic strip walls. That was just a preview of my favourite murals. 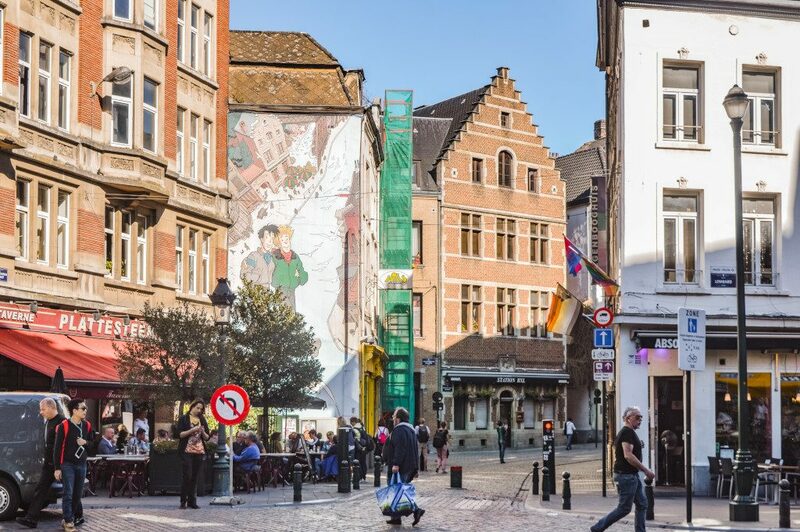 Keep in mind that there’s a lot more to explore outside of central Brussels as well! 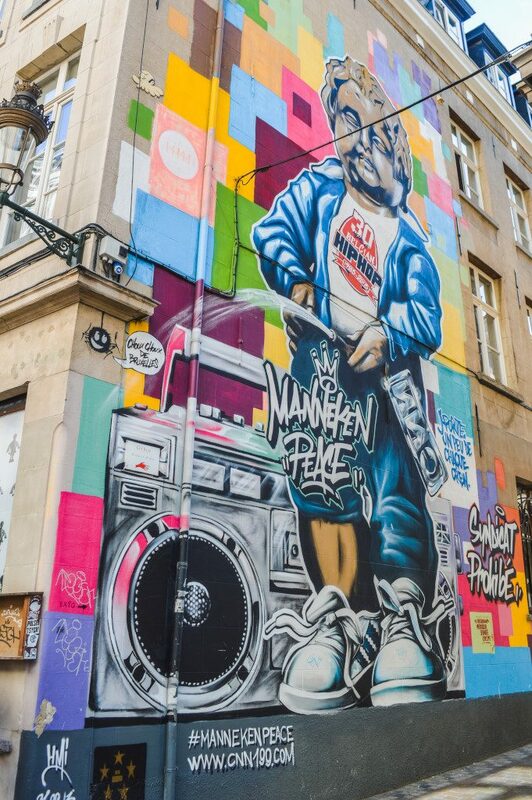 Normally, this is where I would include a street art map where I share the locations of the best street art in Brussels. 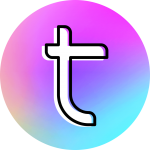 But thankfully, there’s even a special website that has already created an extensive overview. You’ll find all the information you’ll need over at Parcours Street Art, where they also regularly update and add new murals. 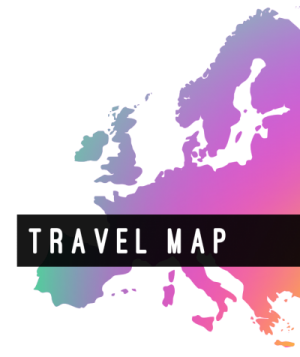 You can check their complete map (excluding the comic book walls) on their homepage.